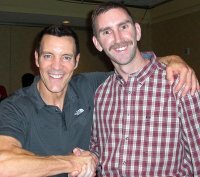 I recently returned from Philadelphia, where I personally had the opportunity to meet Tony Horton. Since 2005, I have been experiencing Tony Horton workouts in my home. Starting with Power 90, followed by P90X, P90X Plus, and now One on One. Along the way I have also used Tony Horton’s 10 Minute Trainer. In the past several years, Tony has motivated me and encouraged me through his programs, but until this past weekend, I have never personally met the man, or had the opportunity to shake his hand. Attending the Tony Horton Fitness Camp, working out live with Tony Horton, and listening to his seminars, was a long awaited, once in a lifetime opportunity. Also attending the camp were other Beachbody Coaches (such as myself), other fitness fanatics, and Tony Horton fans. The collective energy of being with other individuals with similar fitness goals was also a highlight of the camp. Not to mention, I was able to meet up with my fitness coach, Mark Briggs. You may have seen Mark on the P90X Plus workout DVDs. You might have also noticed Traci Morrow on the DVDs, and she was present as well. 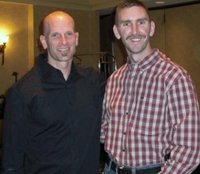 Making new fitness friends, incredible workouts, and fitness/nutritional seminars taught by Tony Horton…. what else could you ask for? So let me tell you about the Tony Horton Fitness Camp. immediately greeted by Mark Briggs. Since 2005, I have visited with Mark on the phone, emails, and message boards, but this was the first opportunity I had to meet him. Truly an inspiration to all that know Mark or seen him around the Beachbody circles. When I started working out, Mark was already in phenomenal shape. I looked to Mark to set the “bar”. He does this without fail, and has been doing so since I first spoke with him in 2005. His constant motivation and personal work out ethic has continued to push me forwards and still does even today. Keep up the great work Mark! Shortly after meeting Mark, a small group of 10-12 people decided to get in a workout, Briggs had touched base with Tony Horton, and we ended up getting in a 45 minute workout with Tony Horton. How awesome is that? To be working out live with Tony Horton! Tony is every bit the person he is on the DVDs. He’s personable, encouraging, knowledgeable, and inspiring. Keep in mind, I have seen Tony on the DVD/TV player for over 4 years, 6 days a week. He’s a household name in our home, so meeting him was every bit like meeting a celebrity. That evening we had a seminar on “Form and Focus”. Tony Horton has a way of putting everything into perspective. A brief summary of the seminar… Tony spoke about the importance of good form during your workouts, and the focus you should be giving to a healthy lifestyle and your workouts. I have always used the old philosophy, “Where there is a will there is a way” towards working out and eating right. But no one can put that into perspective like Tony. Tony encourages 5-6 days a week for your workouts, at a MINIMUM of 20 minutes per day. A good nutritional standard would be 90% of your meals to be healthy meals, at around 5-6 meals per day. Live life, enjoy life, but within reason. The following day, Saturday consisted of 2 more workouts. One was called UCML (Upper, Cardio, Middle (abs), and Lower), with 1 minute on each exercise. I think we did 5 rounds. Later that afternoon, Tony led us through a Yoga workout. 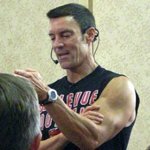 Tony Horton highly encourages Yoga workouts, what he considers the Fountain of Youth. The benefits of Yoga can be found here in this article called The Benefits of Yoga, and How It Improves Your Fitness. I personally recommend the One on One Fountain of Youth or One on One Patience Hummingbird. Also on Saturday Tony Horton spoke about his 11 Laws of Fitness. I have read this article several times, but hearing the 11 Laws come from Tony was even better then reading the article. There are several items in this article, and one of them is bound to benefit you. If you haven’t read this article, please do, and apply it to your fitness journey. If you have read the article, take another look. we heard from several people about their fitness journeys. How they got started and why, and what they accomplished. Very inspirational testimonies. Hearing these people speak, reinforced what I have always believed. Anyone and everyone can reach their fitness goals. Whether that be weight loss, more flexibility, improved health…. I encourage everyone to just get started. Start today, if you haven’t already. Start walking, jogging, push ups or sit ups. Just get your body moving. I can personally recommend any of Tony Horton’s workouts. I have tried them all, and love them all. These programs work, not only for me, but several more that gave their testimony at camp. Regardless of your circumstances, they can work for you to. There is something for everyone. As always, I’m always available to help you. Just email me, ask your questions. If I can help you with picking out a program, your diet and nutrition, anything at all. The one thing I want to emphasize, I’m easy to reach, and happy to help. Don’t imagine that I’m too busy to help. It may take me a day or two (at the most), but I do respond to all of my customers! Sunday was a special day. Tony Horton led us through 3 brand new 10 Minute Trainer workouts. A quick word on 10 Minute Trainer. You can definitely get in a great workout with 10 Minute Trainer. We stacked 3 workouts, so the workout was just over 30 minutes. And this is one of the greatest things about 10 Minute Trainer. You can start with one workout per day. Then add a 2nd workout for 20 minutes per day, then a 3rd workout. As you improve your level of fitness, you “stack” another workout. You can also check out some of our 10 Minute Trainer Reviews. After our 10 Minute Trainer workout, we took a short break, and then we got another “first”. Tony is releasing a new abs workout called Iso Abs for his One on One series. It’s been filmed, but not released. Tony ran us through the workout, and during the workout, he made this comment, “This workout will tell you immediately if your core is weak.” I can not wait to get this DVD! There are two ways to get the One on One workouts. Either here at the store or, even better, get the subscription. I am on the subscription, and get a new workout every month. It’s the highlight of each month. If you get the subscription, on that page, just click Video, and then Tony Horton. The subscription for One on One is at the top. Scroll down and you can get the previous workouts as well! After the Sunday workouts, it was time to wrap up and head home. Reluctantly, I left Philadelphia and the fitness camp behind, but at the same time was anxious to get home to my family. But the vast amount of experience and knowledge taken from the camp was well worth the trip. A special thanks to Tony Horton of course! PreviousIt’s Fall! 10 Foods to Help You Stay Fit! Try P90X & Turbo Fire for FREE – Trial Offer!! WOW great job I loved the article hope I get to workout with Tony some day! You are a lucky man! Hows does this one on one ISO abs go? how long is it? I don’t recall every exercise in ISO Abs. They are all slow, deliberate movements. I’d say its around 30 minutes, give or take. THanks for stopping by.